New efficient technologies of vermicular graphite iron casting manufacture using inocu-lants of the new generation are presented. The developed environmentally safe technologies ensure manufacturing of unique automotive and diesel castings from vermicular graphite iron allowing to enhance diesel engine power by 40 to 50% without increasing the power unit mass and without negatively affecting the charge by using own return material. Key words: last iron, vermicular graphite, structure, inoculants, diesel engines. The authors' investigations into the regularities of cast iron crystallization in expendable clay-bonded sand molds have shown the effectiveness of late graphitizing inoculation. Variants of preventing chill forming conditions in thin-walled automotive castings are discussed. Keywords: graphitizing inoculation, crystallization, chill, castability, mold. The authors have developed a concept of controlling the stable process of manufacturing vermicular graphite iron castings. A process monitoring system is presented. The system assures casting quality, stability of required macro- and microstructure of vermicular graphite iron. 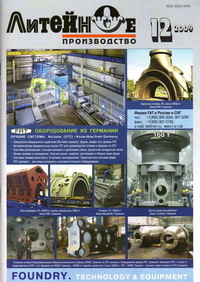 Practical implementation of the process at the operating iron casting production facilities of ОАО KAMAZ-Metallurgiya is shown by concrete examples. Key words: vermicular graphite iron, process monitoring, inoculation. The authors show the technological and economic aspects of the effectiveness of switching the automotive nodular graphite casting production from in-mold inoculation to ladle treatment with wire inoculants. By example of specific castings, data on high stability of the process under the conditions of ОАО KAMAZ-Metallurgiya's Foundry are given. Ways of step-by-step mastering of the process of wire inoculation of cast iron at the operating facilities jointly by ОАО KAMAZ-Metalurgiya's and the company Projelta's specialists (Italy) are presented. Keywords: wire inoculants, ladle inoculation, powder filler, high-strength cast iron, nodular graphite. The article analyzes the quality of core sands prepared by different processes. Issues arising in the core production for intricate automotive castings are dealt with. Experience of ОАО KAMAZ-Metallurgiya's specialists in mastering the Cold box core making process with gaseous hardener is shown. Key words: mold, core, hardener, sand. The article is of a certain practical interest to specialists working in the fields of making gas- turbine engine (GTE) parts. It contains technological recommendations for the production of defect-free castings from intermetallide alloys of the VKNA type. Keywords: intermetallide alloy, heat resistance, temperature-and-time parameters, block, blade, phase composition. Turilova К.К. Reference Point of Efficiency of the Foundry Industry. Where Is It? Are you eager to improve profitability of your foundry plant? Sectoral, intersectoral, national and international foundry benchmarking study of the key performance indicators is the first step to efficiency improvement of foundry business. This instrument has not been used by foundry sector in Russia yet. However, the first Russian companies that take part in the foundry benchmarking study will get a significant competitive advantage. An algorithm of pressure regulation for the control system of a casting complex with crystallization under pressure, forming the preset law of the work member's motion is proposed. Key words: die casting, control system, algorithm, predictive analyzer.